(Nanowerk News) Organic-inorganic hybrid perovskites have attracted much attention in solar cells, light-emitting diodes, and lasers, due to their rich physicochemical properties. However, above-room-temperature antiferroelectrics based on hybrid perovskites still remain unexplored. 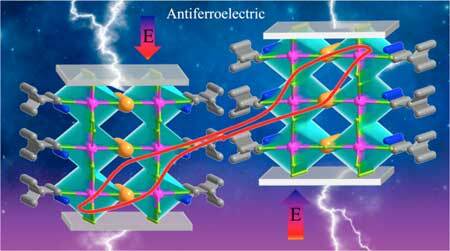 In a recent study published in Journal of the American Chemical Society ("Discovery of an Above-Room-Temperature Antiferroelectric in Two-Dimensional Hybrid Perovskite"), the research group led by Prof. SUN Zhihua and LUO Junhua from Fujian Institute of Research on the Structure of Matter (FJIRSM) of Chinese Academy of Sciences firstly constructed above-room-temperature antiferroelectric with high energy storage efficiency based on two-dimensional organic-inorganic hybrid perovskite. Researchers found that the displacement of adjacent inorganic alkali metal Cs atoms and the orientation of organic cations in the antiferroelectric compound synergistically induce the generation of antiparallel dipoles. At the same time, under externally electric field, antiferroelectricity of this compound exists in wide temperature range from room temperature to Curie phase transition temperature (298-353 K). In addition, they found that the antiferroelectric material exhibits high energy storage efficiency up to 69%, comparable to inorganic antiferroelectric ceramics. The results not only provides a design strategy for deign new antiferroelectric materials, but also expands the researches for the mechanism of organic-inorganic hybrid antiferroelectrics and energy storage applications.